Here are a few reasons to leave the safety of your home on this Black Friday. Black Friday is a special holiday known for its miraculous ability to awaken Americans from their turkey induced comas and bring them out in droves to packed malls and Best Buys across the nation. Of course, there's a chance you might score a good price on that TV, but the deals will continue throughout the holiday season and it's usually best to just avoid the mayhem. One shopping trip we can justify as a good investment of time on Black Friday, is a trip to the car dealership. Skip the department store electronics department and get the latest tech in a new truck instead. In some cases, the Black Friday car deals you find this year can be attributed to automakers and dealers trying to clear inventory and make room for new 2019 models. Alternatively, some 2019 vehicles get the discounts and incentives to drum up excitement and get car shoppers in on the holiday hype. Depending on the vehicle you're looking for, Black Friday deals can add up to substantial savings for you and yours. We looked at data compiled by Cars.com from 6 major US metros to bring you the top Black Friday discounts and incentives for SUVs, pickup trucks and sedans. Trust us, these are the deals worth battling traffic for. The Chevy Equinox got a redesign for 2018 and carries over the new features into the 2019 model. We found the technology in the Equinox was user-friendly, the interior was spacious enough for families, and performance was better than ever. A capable engine, along with precise steering and handling make the Equinox a great choice for car shoppers. The 2019 Chevy Equinox's starting MSRP is $23,800. The 2019 Jeep Cherokee is new and improved with a redesigned exterior, updated infotainment, and a new 2.0-liter turbocharged engine. Jeep has also lightened the 2019 Cherokee by 150 lbs thanks to a shorter front end and lighter weight materials throughout. To cap off the improvements, the Cherokee has an all-new interior with quality materials found even in the base model. The 2019 Jeep Cherokee Starting MSRP is $24,544. The 2018 Nissan Titan remains almost entirely unchanged from the 2017 redesigned model. After driving the 2017 Titan S we found it to be a capable full-size truck with a strong V8 engine, usable cabin storage, and great seats. Ride quality is a good balance of firm and comfortable and predictable steering tops off the benefits for this no-frills work truck. The 2019 Nissan Titan's starting MSRP is $30,390. 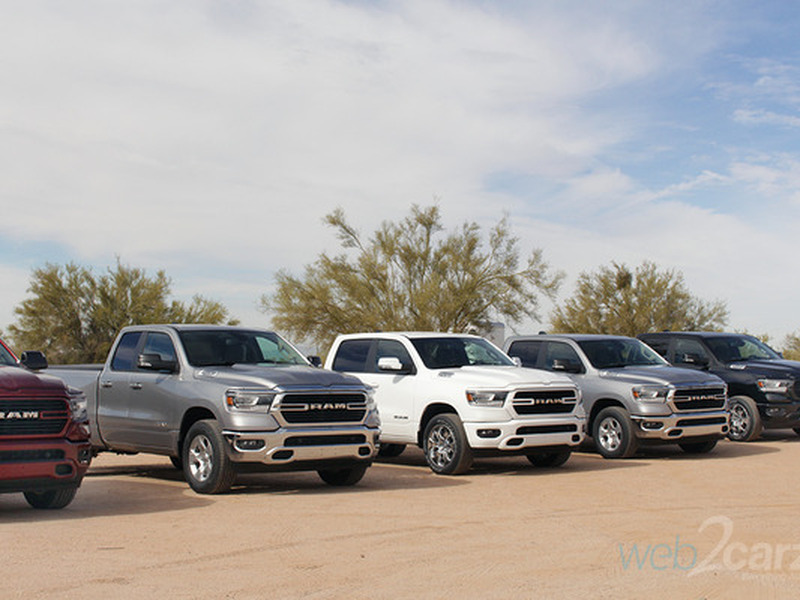 We tested out the 2019 Ram 1500 and found it excellent to drive. This is thanks to an updated suspension resulting in a smooth ride, an impressive HEMI V8 and a quick 0-60 of just over 6 seconds. On top of the capable engine, one of our favorite features was the versatile interior storage space offering a folding center armrest and cubbies that allow for a middle seat in the front row. The optional 12-inch touchscreen on the higher trims will give you your Black Friday electronics fix. The 2019 Ram 1500's starting MSRP is $31,795. The 2018 Chevy Malibu is a stylish and spacious sedan that drives smoothly and handles well. We drove the 2017 model which is nearly identical to the 2018 Malibu. The Chevy Malibu has a potent 2.0-liter four-cylinder turbocharged engine which offers great acceleration and might just make you believe you're driving a V6. Comfort is an added perk of the 2018 Malibu with supportive and cushioned front seats that make even long drives enjoyable. The 2018 Chevy Malibu's starting MSRP is $22,090. The mid-size Ford Fusion is one of the most attractive family sedans on the market. Although Ford has not changed the Fusion's body shape in a few years, they recently refreshed the front fascia, grille and headlights on the higher trims. Despite a weaker base engine that only offers up 175 hp, the 2018 Fusion makes a good everyday vehicle (especially if you upgrade to the higher level trims). Space is the name of the Ford Fusion's game since it offers more interior room and trunk space than many competitors. The 2018 Ford Fusion's starting MSRP is $22,215.